When I graduated from college in May, I experienced a mix of emotions. I was proud of myself for everything I had accomplished during my four years at Clemson. I worked in the Social Media Listening Center—a research lab and teaching facility where students could track real-time chatter of events such as presidential elections, sporting events, and other news items. This experience piqued my interest in social media analytics. I also had the opportunity to study abroad in Germany and advance my communication skills and knowledge in public relations. And in my last year of college, I completed my senior thesis examining how Twitter chatter affected people’s perception of mental health. However, I was still unsure of what my future held. I wanted to use my writing and social media skills after college and began researching available jobs in the Raleigh/Durham area. When I typed “social media analytics intern NC” into the Google search bar, the first job posting was TrialCard’s. I had never heard of TrialCard but wanted to learn more about the company and the position. As I read the job description, I knew this internship was perfect for me; it allowed me to use my skills for a company that helped patients pay for medications that were otherwise inaccessible to them. As I filled out the application, submitted it, and continued to peruse TrialCard’s website, I was happy to learn that TrialCard had a passion for philanthropy. This made me even more confident in my decision to apply, as I was actively involved in a volunteer organization at Clemson that engaged with the community. Although I was unable to do a face-to-face interview, I knew from my phone call with the Marketing team that I would be a perfect fit with TrialCard. I have now been a TrialCard intern for four weeks and have enjoyed every minute of it. This has not been an internship where you just get coffee or make copies. I have been working on a competitive analysis project that I will present to TrialCard’s leadership team at the end of the summer, working with my fellow interns on a group project, and also have the opportunity to help write case studies and other marketing materials. One of the things that has stood out to me during my time at TrialCard is the people. Everyone has been so kind and welcoming, and I know that I can reach out to anyone for assistance or advice. I’ve also had the chance to bond with my coworkers and other interns outside of the office at events like Durham Bulls baseball games and volunteer days at the Ronald McDonald House. To come into such a positive, hospitable environment right out of college has meant so much to me. From being surrounded by strong female role models who encouraged me at every turn to learning more about the world of Google Analytics and other social listening tools, I have acquired many skills and life lessons that I will carry with me in my professional career. I am looking forward to continuing my work for TrialCard this summer and learning how social media can impact the healthcare world beyond a screen. 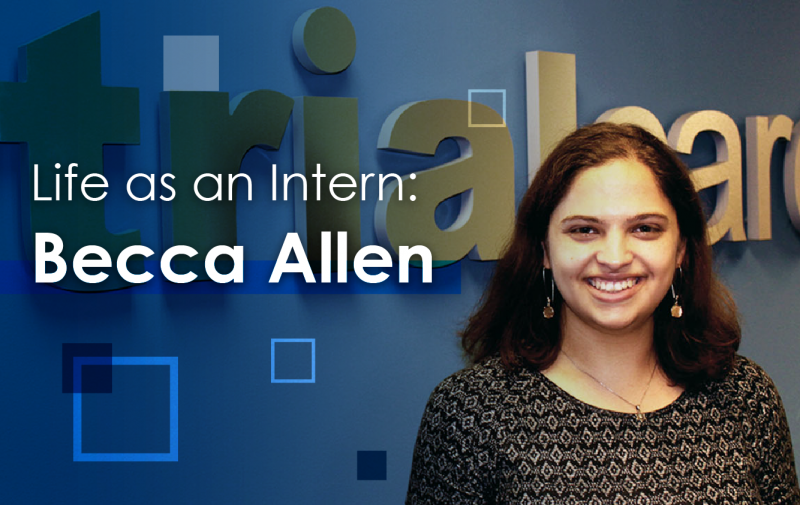 Becca Allen is a recent graduate of Clemson University who majored in Communications and Media Writing. She currently resides in Holly Springs, NC and enjoys reading, spending time with friends and family, and cooking.